“I joined the Lomas Barbudal Monkey Project as a field assistant in November 2003 and never expected what a profound impact the experience would have on me. I remember being quite overwhelmed by the physical demands of the job, coping with tropical heat, enduring torrential rainstorms and accepting being eaten alive by mosquitoes and chiggers. My whole body felt like tiny needles were spiking into it from the permanent heat rush and my backpack was rubbing into my shoulders as if it was trying to slowly sever my arms. In my first month I seriously doubted I would last through my one year contract. I did last. I grew stronger and the demands of the job seemed easier. Dry season is a good time to do field work! 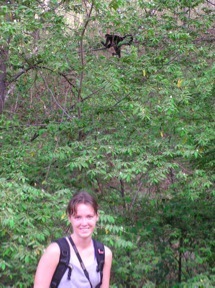 It also turned out that I was quite skilled as a monkey observer. I found friends and genuinely fell in love with Costa Rican biodiversity. In short, I felt happy and at home in my new environment. So the girl that considered quitting in her first month came to stay ten years on the project working as data analyst, field site manager and outreach officer. The Lomas Barbudal Monkey Project shaped me to be the person I am now. That was not always an easy or comfortable route and I made a great many mistakes along the way, but I was also lucky to enjoy the support of all the wonderful and extraordinary people I have met on the job. The army of “moneros” (as assistants of the project proudly call themselves) is a magnificent one. Every single one of these brave, tenacious and loyal men and women worked hard to make the project what it is today. 25 years of wild capuchin research is truly remarkable! In 2013 I left the project for Britain. In the meantime I have obtained a Master’s degree in Conservation and Biodiversity from the University of Exeter where I currently work as a teaching technician. Last year I was invited to join the Board of Directors of the Wild Capuchin Foundation, so I am still in touch with development in Lomas and monkey antics (as well as hard science!). Hearing about it just is not quite the same and I hope I will have the opportunity to go visit the field site before long. I miss it dearly. Congratulations, Lomas Barbudal Monkey Project! Wishing you many, many more anniversaries to come! 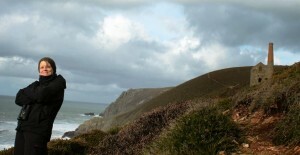 Cindy spent a year working on the Lomas Barbudal Monkey Project in 2004-5. In 2005 she received an NSF graduate fellowship and was admitted to graduate school in the University of Chicago’s Comparative Human Development program, where she received her Ph.D. in 2011. For her graduate work, she established a field project on mating behavior in pig-tailed macaques in Thailand. 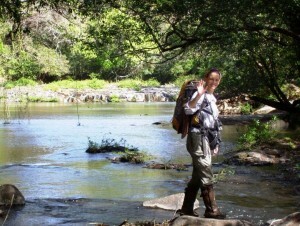 Amber got her start studying primate behavior in the wild by working for a year on the Lomas Barbudal Monkey Project in 2007-8. In 2009 she received a Sacred Heart Scholarship to attend Roehampton University in London, England and completed her Master’s degree in 2010. Amber received a fellowship to attend the University of Toronto in 2011 and will graduate with her PhD in Biological Anthropology in 2016. For her graduate work, she studies mating behavior, communication and competition in ring-tailed lemurs (Lemur catta) at Berenty Reserve, Madagascar. ‘During my year in the field at Lomas Barbudal I was lucky to see so many fascinating behaviors. One type of behavior that stood out was the way males would perform displays to seemingly impress others. Some examples were males branch breaking and dragging large, dead branches with their tails, making impressively noisy displays. 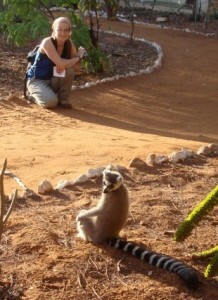 When I left the program I went on to volunteer for six months at Berenty Reserve, observing ring-tailed lemurs. One early morning as the sun was rising I saw a male performing a tail anointing and wafting display to a group of females who were huddled together. The male received a slap across the face from the dominant female for performing this display. I immediately made the connection with behavior I had seen previously among the capuchins. Could this tail anointing and wafting to females be a costly display which has an impact on male mating and reproductive success? This single early morning observation has led to years of study on how male tail anointing and wafting to females operates as a sexual signal. Future directions include conducting paternity analysis on the hair samples I have collected during my PhD fieldwork to determine whether a relationship exists between male tail anointing and wafting and siring offspring.